Cauliflower's tightly packed white florets provide a great crunch when consumed fresh and transform into a tender texture when cooked. Trim the stalk off close to the base of the head and trim the leaves. Cut into florets or leave whole. Roast cauliflower in the oven, make it into a creamy soup, or even substitute it as a healthy pizza crust. The versatility of this vegetable makes it easy to incorporate frequently into your menu. Substitute cauliflower rice for regular rice as a side dish for a nutritious low-calorie, grain-free alternative. 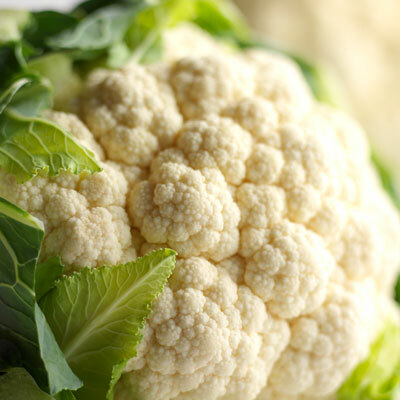 Pick out cauliflower with creamy white, compact curds and bright green leaves. Store Cauliflower in the crisper section of the refrigerator. Always wash fresh produce before consuming.